The Hon Brian Thomas Sully AM QC, former Supreme Court judge and life member of the New South Wales Bar Association, died yesterday evening. Members will be advised of funeral arrangements as soon as they are known. An obituary will be published in a forthcoming edition of Bar News. The Australian Human Rights Commission has been conducting a National Inquiry into Sexual Harassment in Australian Workplaces. The focus of the inquiry is on the nature and prevalence of sexual harassment in Australian workplaces, the drivers of this harassment and measures to address sexual harassment in Australian workplaces. As part of the inquiry the commission asked both individuals and organisations to make submissions conveying their views, experiences and suggestions for change. The New South Wales Bar Association’s submission can be found here. The Bar Association is committed to playing a leading role in addressing sexual harassment in the workplace and the particular issues which arise in respect of it at the NSW Bar. The Bar Council is currently reviewing a number of recommendations from the Diversity and Equality Committee that further address the issues raised in the submission. It is incumbent upon all of us to work actively to eradicate sexual harassment from our workplaces. I encourage all members to read the submission. I would also encourage members to attend the Bar Seminar Series Responding to Sexual Harassment at the Bar which is to take place on 13 and 18 March of this year. The standard period of renewal will commence 1 April 2019 and end 7 June 2019, and the later period will commence 8 June 2019 to 30 June 2019. In the lead up to the renewals period, Barristers will be advised of the URL access to the new online renewals portal. Login remains the same as your member dashboard login and password. Tonight: Is the modern company fit for purpose? The 2019 Bathurst Lecture will be held at 5.15pm on Wednesday, 6 March 2019 in the Banco Court. It will be delivered by Graham Bradley AM, senior company director, former president of the Business Council of Australia and deputy president of the Takeovers Panel. Mr Bradley is the non-executive chairman of HSBC Bank Australia, Virgin Australia International Holdings, EnergyAustraliaHoldings and GrainCorp Limited, chairman of Infrastructure NSW and a director of Tennis Australia. Legal Aid News March 2019 is out now! The March edition of Legal Aid News is now available, featuring a new Youth Koori Court, a report exploring ways to improve access to legal assistance along the NSW/Victorian border, and the inspirational stories of people clearing their debts as part of a pioneering justice scheme. A full copy is available here. The International Law Section of the Law Council of Australia invites you to attend the ILS International Law and Practice Course 2019 and be inspired by the exciting roster of expert speakers as they share their knowledge and experience with you. Starting off the lecture series we have guest speaker Hajo Duken who will speak on the topic of EU law: Single market, four freedoms, customs union and the Brexit crisis. Chaired by Dr Martyn Taylor. Brexit has moved the principles, legal frameworks and institutions of the EU into the centre of political and legal discussions around the world. In this session we will briefly revisit the key learnings from last year’s lecture before diving deeper into the meaning and practical implications of the single market, the four freedoms and the customs union. This will help us to understand and discuss the unprecedented challenges both the EU and the UK are facing in what is now commonly described as the ‘Brexit mess’ or the ‘Brexit crisis’. A ceremonial sitting of the Family Court will be held in Courtroom 7C, Level 7, Lionel Bowen Building, 97-99 Goulburn Street, Sydney, at 4:00pm on Wednesday, 6 March 2019 to welcome the Honourable Justice Louise Henderson as a judge of the Family Court of Australia. Michael Kearney SC will speak on behalf of the New South Wales Bar and the Australian Bar Association. Barristers should wear robes but not wigs. No.10 Bistro was the venue today for the first Bench and Bar Lunch of 2019. 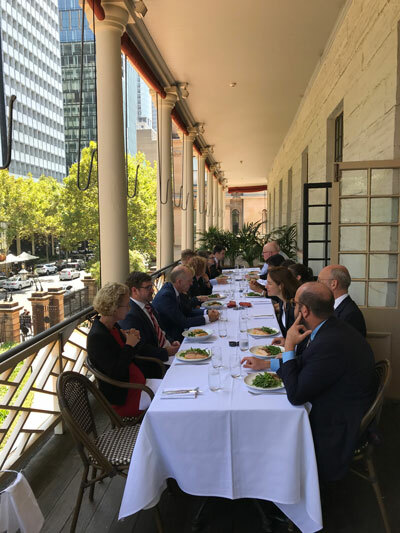 It was a full house, as 75 members of the New South Wales Bar, together with several judges from the Family Court, Federal Court, Supreme Court and the District Court enjoyed excellent food and punctual service on a beautiful Sydney afternoon. Those with a seat on the balcony were especially lucky. If you haven't already done so, enjoying a Bench and Bar Lunch is an ideal introduction to the collegiality of the NSW Bar. Bench and Bar Lunches are an initiative of the Bar Association's Wellbeing Committee and proudly sponsored by BarCover. Is the modern company fit for purpose? The Australian Bar Association draws upon the experience and knowledge of its members to effectively represent the profession and advance public debate on law reform and legal policy issues. The ABA's committees are comprised of members from the Association's constituent bodies. Each year the ABA reviews the need for committees, the role of each committee and membership of committees. A list of committees receiving nominations can be found here. ABA members who wish to be considered for appointment to a committee should complete the online form indicating the committees for which they wish to be considered. Members should nominate for no more than two committees. Existing members of committees who wish to continue on a particular committee should also complete the online form. Presented by The Honourable Justice Louise Henderson, Family Court of Australia and Her Honour Judge Elizabeth Boyle, Federal Circuit Court of Australia and chaired by Angela Petrie. Learn more here. This seminar has been organised by the NSW Bar Association’s Family Law Committee. The Workers Compensation (Indexation) Order 2019 was notified and published on the NSW Legislation website and came into effect on 28 February 2019. The order notifies the indexed adjustments to workers compensation benefits on and from 1 April 2019. A copy of the order is available here. To find out more, log into your Bar Association member dashboard and follow the links to the Member Advantage website. Suncorp Bank may pay a commission to Member Advantage of 0.20% of the total loan balance (or credit limit), for a referral of a potential borrower to Suncorp Bank for the purposes of obtaining an Eligible Loan. Banking products are issued by Suncorp-Metway Ltd ABN 66 010 831 722 AFSL No 229882 Australian Credit Licence 229882 ("Suncorp Bank") to approved applicants only. Please read the relevant Product Information Document and Terms and Conditions before making a decision regarding these products. Fees, charges, terms and conditions apply and are available on request or via the dedicated site above. The Motor Accident Injuries (Indexation) Amendment (Weekly Statutory Benefits) Order 2019 (NSW) was published on the NSW legislation website. Made under section 3.22 (3) of the Motor Accident Injuries Act 2017, the order is used to calculate the variation of the amount of a weekly payment of statutory benefits to be paid to a person who has been injured in a motor accident to which the Act applies. The Act requires the amount of a weekly payment of statutory benefits to be varied on 1 April and 1 October each year. The Regulation and Orders can be accessed here. Pursuant to the Children (Detention Centres) Act 1987, the Children (Detention Centres) Regulation 2015 provides for a new detainee classification system. The regulation has been gazetted and came into effect on 28 February 2019. This annual one-day conference will be held in Sydney on Saturday, 25 May 2019 at the Sheraton Grand Sydney Hyde Park Hotel. The conference, which has been held since 1989, provides an open forum for discussion of significant issues in competition law and attracts a broad range of registrants and participants, including Federal Court judges, judges from New Zealand, regulators from Australia and New Zealand, competition law practitioners from both Australia and New Zealand, economists, academics and representatives of business. The conference provides an opportunity for those interested in competition law to update their knowledge on the specific areas covered by this year’s conference including: avoiding liability under the CCA; assessing multi-sided platforms, SLC under the new s 46 and proof of collusion in cartel cases. The sessions are presented by a distinguished former High Court judge and leading competition law practitioners. For full details, please download a flyer here. Presented by Dr Rosemary Howell, Chair, Strategic Action Pty Ltd, and Professorial Visiting Fellow of the University of New South Wales and Sue-Ella Prodonovich, Principal of Prodonovich Advisory. Chaired by Elizabeth Cheeseman SC, Chair, Practice Development Committee. Learn more here. This seminar has been organised by the NSW Bar Association’s Practice Development Committee.